As I am putting in place the last few details for our upcoming Highlands and Islands tour my thoughts of course turn to some of my very favorite places. The first time I was on the Isle of Iona I felt as if I had just had the wind knocked out of me. The feeling was more intense than I was expecting even though I was expecting to be hit pretty hard. It is one of the most peaceful places on earth and it is easy to understand why St. Columba used it as his base for Christianity in Scotland when arriving in the year 563. Even more powerful than that was the feeling, I got when I stepped into the wee small chapel next to Iona Abbey. 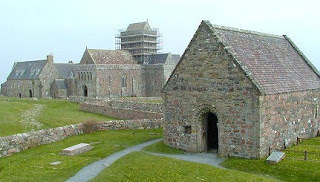 St Oran's Chapel is the oldest intact building within the religious settlement at Iona. It was built in the 1100's by Somerled, Lord of the Isles, as a family burial chapel. It stands in Reilig Odhrain burial grounds where the remains of 48 Scottish Kings were laid to rest along with those of Norway and Ireland. Kings such as Macbeth and Duncan I, as well as later Lords of the Isles. Being a descendant of Somerled makes this a very special place and I love to sit in the chapel and ponder the history of my family. Looking across the north wall of Reilig Odhrain you can see a medieval roadway leading to the Abbey. After repeated attacks by Norse invaders, little remains of Columba's early Christian monastery today. The present Abbey was built around the year 1200 for Benedictine monks and it was dedicated to St. Columba. After the reformation much of it had fallen into ruins but was restored at the start of the 20th century. In 1938, George Macleod, a minister in Glasgow, founded the Iona Community and the long process of rebuilding was begun. Today Iona Abbey and the surrounding buildings serve as a spiritual center under the jurisdiction of the Church of Scotland. You can't help but be moved by the Abbey. The atmosphere is filled with the weight of the centuries and the very stones seem to tell the story. There are grander Abbeys to be found in Scotland but none quite so solemn, humble and modestly elegant.